Melissa Bratton brings a lot of Disney experience to the table. Her love for Disney World started with her first trip at age 10. She has been helping her family and friends plan trips for years, so becoming an agent with Small World Big Fun was a perfect fit! Melissa’s passion is helping clients choose the best place to stay, the best places to eat, and the best things to do on their trip — all while finding the best value for their money. That first trip that began Melissa’s love of Disney was followed by many more Disney vacations, including a school FBLA and a high school graduation trip all in one month in the summer of ’89! When she was in her early 20s, she traveled to Tampa for business and knew she couldn’t be that close and not visit Disney! She went down a day early, met up with a friend who was a former Cast Member and still lived in Orlando, and spent the day at Disney. One day into the pre-baby trip and Lance was hooked on Disney! 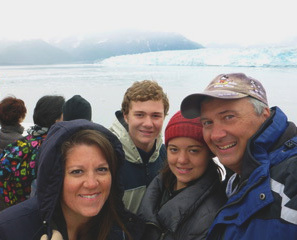 The Brattons have since had two children and have taken them on many Disney vacations: Disney World, Disneyland, Disney’s Aulani in Hawaii, and Disney Cruises to the Baja Coast, Panama Canal, South America, Mexico, the Caribbean, the Bahamas, Canada, and Alaska. And, Lance and Melissa spent ten days in Peru on an Adventures by Disney trip celebrating their anniversary a few years ago. It is safe to say the Brattons are a fully committed Disney family. Since becoming a travel agent, Melissa has expanded her area of knowledge. In addition to planning trips for the full line of Disney Destinations, she plans trips to Universal Studios Orlando, European river cruises, and beach vacations (and weddings) to properties owned by Sandals, Beaches and more. Melissa is looking forward to helping more families plan for wonderful vacations to Disney and beyond. You can reach her at 501-786-0971 or Melissa@smallworldbigfun.com. Also, check out her blog at www.travelneverlands.com.